This meal is a great showcase for National Vegetarian Week, showing that veggie eating doesn’t need to be a pastiche of your traditional meaty dinner with a “star of the show”. In fact, I had some trouble naming this recipe. None of the ingredients is really ‘with’ the other ones – they all take centre stage, playing off each other. There is no Diana Ross to the Supremes here, no Martha Reeves for the Vandellas. It’s more a Shirelles situation, if you’re still following along with me. This is based on a Hugh Fearnley-Whittingstall recipe, but I found the original a little flat. I countered the earthy courgette and nutty grain with sharper feta and citrus-y sumac, both of which boosted the Middle-Eastern feel to the dish. 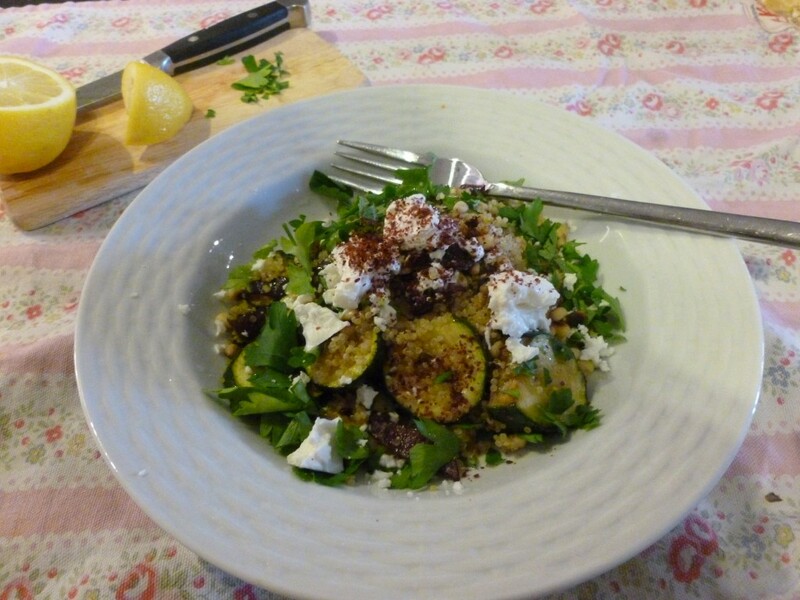 Health-wise, you’ve got micronutrients and protein in your quinoa, calcium in your feta and fibre and vitamins in your courgettes. I don’t believe in hugely changing your diet for carb-loading before a race (why would I start eating huge amounts of white flour now, even if it is disguised as pasta? ), so I’ll be having this towards the end of the week before we do the Edinburgh Half Marathon on Sunday. Even if the race profile wasn’t all downhill, which thankfully it is, I’m sure I’d fly through.